On the other hand, there are some people who just LOVE planning. They happily plan and plan and plan, but they never take any action. They use planning as an excuse to not DO anything. It justifies their procrastination. 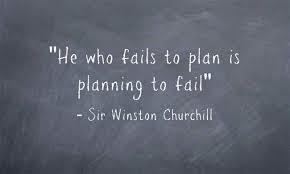 Planning without purpose is a waste of time. If you’re in this group (and I’ve certainly been guilty of this), read this right now. The truth is you don’t have to plan in order to be successful, but you increase the risk of failure massively if you don’t, especially when starting (and running) a business. And with the amount of information and help available today there’s no excuse not to plan. Anticipating the risks involved so you can work out how best to deal with them before they happen. Once you’re done, have someone with experience running a business review it. Or go to your local small business development organisation if you have one. If you’re serious about running a successful business, you need to plan. Spending a little time and effort up front can save you major headaches down the road, and may even save you from disaster. Contact me if you’d like some help. P.S. Some people might question my advice here, given that I didn’t have a plan when I quit my 9-to-5 job to start my own business. As I said above, not planning increases your chances of failure, but I had a few other factors on my side. I had already been in the IT industry for 17 years, so I had a lot of knowledge and experience, and also a lot of contacts and colleagues. Networking was also key for me, and I’ll cover that in a future post. If you don’t have a lot of experience in your field, or you’re starting a business outside your area of expertise, planning is critical.